This entry was posted on November 12, 2016, in Featured Blogs and tagged Blog Posts, Bloggers, Caring, Hello and Welcome, life, Networking, Pets, Photos, Sharing, Stories. Meet my blogger friend Joe Cosme. I connected with Joe in this space many months ago and not only has he been supportive, I find his articles inspiring. I never visit his blog and come away empty handed. Today, he has agreed to share more personal details about himself with us. Thank you, Joe for obliging my nosy inquisition. My regards and best wishes in your endeavours. Tell us about Joe. Your background, short biography and general outlook towards life. I am originally from the Bronx, New York and of Puerto Rican and Scottish descent. My Puerto Rican heritage dominated my life. Yet, I do not speak fluent Spanish. I know nothing about my Scottish heritage. I currently live in Florida with my husband of seven years and our two fur babies Maddy and Lotis. A dysfunctional family life and living in the Bronx helped to make me one of the statistics. I was a dropout from the school system by the age of 16. I later returned to school to get my High School Equivalency diploma and went on to college to study Culinary Arts. I subsequently changed my major to Psychology. I made this decision because I started studying metaphysics and saw a correlation between the two. In my opinion, Cognitive behavioural therapy is very similar to using affirmative self-talk. I never completed my studies but continued to explore these subjects independently. To this day these are two things that interest me very much. I am the one on the right. I love understanding how the mind works… what makes people tick… how habitual thought patterns can be changed. I love taking a recipe and making it my own… cooking for others and seeing their faces when they are enjoying the meal I created. My other likes besides cooking and psychology is gardening. These are some of my plants in my garden. Some of my crystal collection. Photography: Some of my shots below. For my singing, you can check out this post for that. Nobody is perfect. But, for the most part, I am a very optimistic person. I have a strong faith in the goodness of my Creator and I believe that there is a reason for everything, because of this, I tend to look for the silver lining in every situation, even in the midst of hard times I look for the reason and try to adjust my attitude to not resist what is going on. Some might call this being a Pollyanna, but I like to think it’s just having faith that I am always where I’m supposed to be in life. Like all people, I have experienced some events in my life that have changed the direction my life was going. One such incident happened in the year 1990. It was the day after Christmas that my life changed as a New York City bus jumped the kerb in Manhattan. I only remember seeing the bus coming toward me. The next thing I remember was being on the corner of 42nd street and Lexington Avenue. The next day I saw myself pictured on some of the major New York newspapers. There I was, laid out on the corner of the streets of Manhattan. The headline read, Miracle On 42nd Street. I survived this accident only by the pure Grace of God. I have the belief that things happen for a reason and that this accident was to help prepare me for what was to happen next in my life. Two months after my accident, my mother was diagnosed with lung cancer and she lasted only 8 months after finding out about her condition. This resulted into my inheriting the responsibility of raising my two younger brothers. I wrote a little about this here if you’d like to read about it. After raising my brothers, I eventually ended up working with special needs people as an education coordinator, coach, and trainer. However, my work with this community ended on October 9, 2013, when I experienced another accident. I bet you thought I was going to say something about Britney Spears 🙂 I won’t go into what happened with this accident, but if you want, you can read about it here. This latest transition in my life leads to the next question. Tell us about your blog and your purpose for starting it. Did you have any set goals in mind when you were setting up your blog? What do you think about the blogging phenomenon itself? After having my last accident my self-image and everything I thought I was changed. I was physically unable to do most of the things I once did. Being physically unable to live as I once had affected me emotionally as well. I soon found myself in depression. The only outlet I had was my journal. One day while writing in my journal I got the inspiration to share my writing and so, “What I Gotta Say About It” was born. However, there’s more to the story. When I first started my blog, I was really interested in informing people about things they might not have known about. Things like the NSA and our privacy, whistleblowers, our civil liberties being taken away, and the like. I also wanted to discuss spirituality and self-improvement. As time went on I realised I like writing about these things but I needed to focus on something concrete. So, I decided to focus on helping people to realise their highest potential but, I also want to take it a step further. I have had an awesome experience interacting with the blogging community. So much so, that I created another site in the form of a social network. It is my hope that I will build a community where everyone can share their knowledge and resources with each other. I’m also researching how to create online courses and would like to offer that. It’s not completely finished yet, but soon enough hopefully. Take us with you on a typical day spent with you. Show us a bit of your World and yes we love photos of your pets if you’ve got any. I was released to go back to work. However, I have limitations. So, this has been quite challenging. I am currently taking a course at Live You Legend. 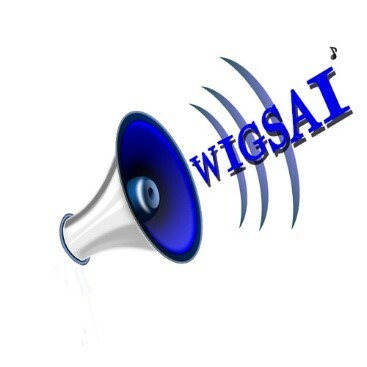 I am also researching options for wigsai.com. I’m contemplating studying to be a life coach. I think some sort of credential would help me on my mission to help other people. Maddy is our dog who is 15 years old. She has random seizures and is prone to getting attacked by Lotis. Lotis is our brand new puppy, who is a handful. 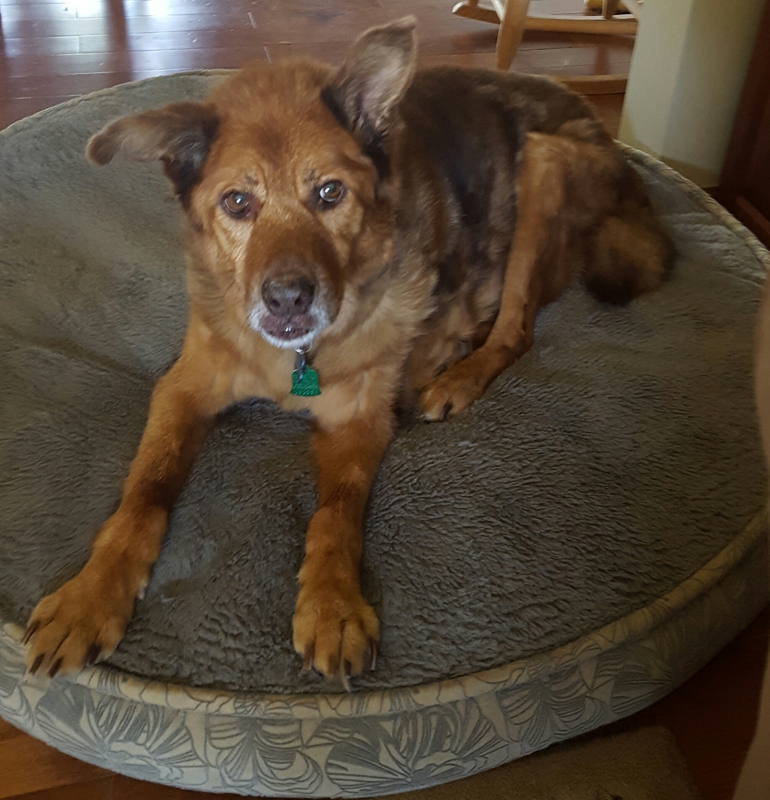 We recently lost one of our fur babies (read about that here) and added Lotis to the mix. He is only 3 months old. Thank you for the opportunity for the interview Jacqueline. Meet my dear friend, a gorgeous lady who lunches with style. The one and only Diane Duke. There are some people you meet on your passage through life and even though you’ve never seen them in the flesh, they still carry enough presence to make you feel warm. Diane is one of such people that I’ve been comfortable to connect with all these months. She’s smart, fun, wise, friendly and has a great sense of humour. I know that one day, I’ll be lunching with Diane and a host of other lovely people whom I’ve met in this space. Please read and enjoy getting to know Diane a bit more. I’ve lived in one suburb of Chicago or another my whole life. I’ve been married for quite awhile now and have a big blended family of two children, three stepchildren, a grandchild, six step grandchildren and even a step great grandson! I don’t usually break things down quite like that, they’re just my kids and grandkids. But I daresay if you saw us all in one room, you’d be hard pressed to know who belongs to whom. There’s kind of a lot of variety in ages! 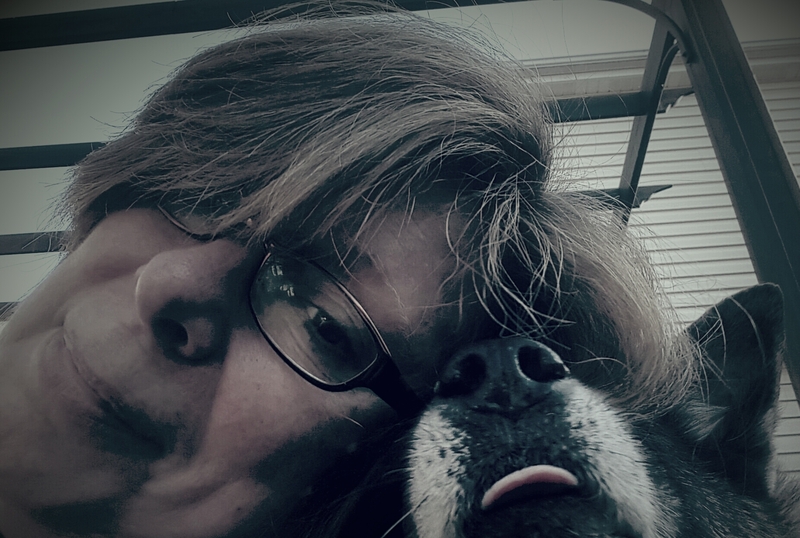 Hubby and I also have two aging fur babies, Chief and Inga. 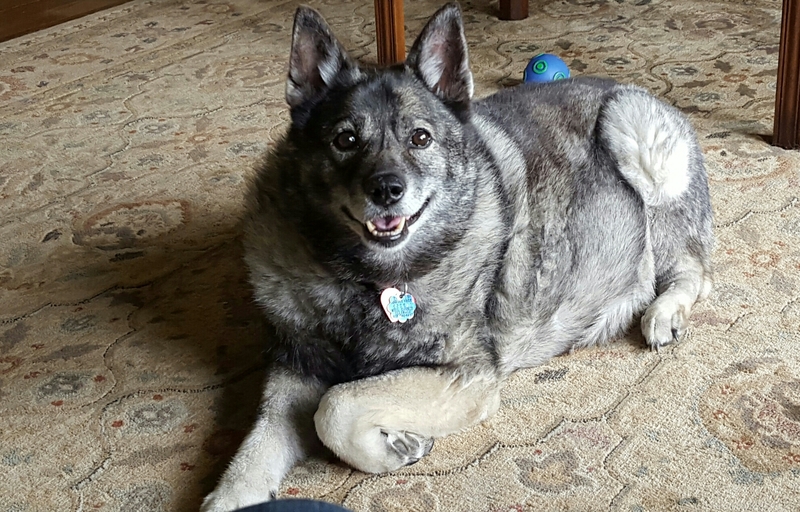 Chief is a Chow/ terrier mix and Inga is a Norwegian Elkhound. Needless to say, there are lots and lots of fur and shedding and summertime is not their favorite time of the year! I have a B.S. in Journalism and it was so long ago that they call it Communications nowadays! I worked at a non-profit agency in Chicago in public relations and wrote press releases and coordinated fundraisers before leaving my job to get married and raise my family. Eventually, I went back to work, at first, it was part time jobs, then full time at a law firm back in the city. My second son was born with lots of health problems so I had to leave that job and concentrate on his medical issues, including several surgeries and therapies over the years. 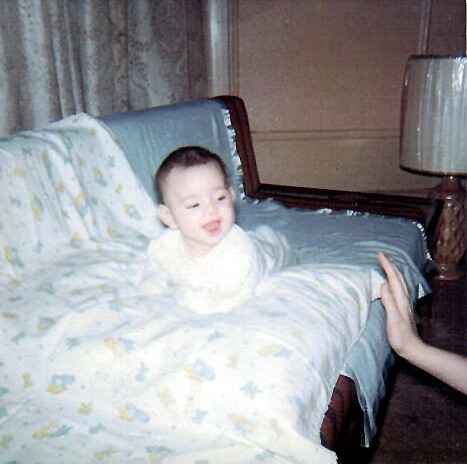 By the time he was three, I started working at home as a court reporting transcriptionist for a Washington, D.C. based firm. Certain federal courts allowed audio recordings, so we would get audio tapes and transcribe them on a deadline and at first mail them back, then later used email. I started my blog because I really missed writing – the only writing I was doing was our Christmas newsletter. I actually started getting requests for it from family and friends. So I plunged in and started a blog. This is how I thought blogging would go: I would read books I wanted (romance and light mysteries), write a review, post it on my blog and people would follow me. I found out quickly that if I did that I’d be writing for no one but myself! So I signed up for WP’s Blogging 101 and made a lot of blogging friends and learned a lot! Since my blog was up and running, I was lucky I had some reviews from Goodreads to repost and keep things going for awhile. Eventually, I started to write some fiction and some articles about things going on in my life, like physical therapy, personal training, babysitting my grandson, etc. I started exploring other blogs and found how much I loved meeting other people and talking with them. It still amazes me that I’ve made blogging friends all over the world! I’ve found blogging challenges to be wonderful fun and a great way to meet other bloggers. I’ve done the A to Z Challenge in April and the ongoing Limerick Challenge at Mind and Life Matters and am in the midst of a Kindness Challenge. Now I spend almost as much time reading and commenting on other people’s blogs as I do writing my own! I never seriously intended to write a book, but I think I may have been bitten by the writing bug and may start tying together some of my shorter pieces into short stories or a possible novella. We shall see what happens down the road! My typical days are spent fixing meals when forced, cleaning the house when I have to and going to the gym to work out a couple times a week. Youngest son still lives at home, so he’s going to work out at the gym now, too. I go to lunch with my friends and I am on a weekly ladies bowling league in the fall and winter. I don’t really like shopping, but that doesn’t mean I don’t like buying! I’m just not much on spending the whole day at the mall. I mow the lawn and garden a little, pick up dog poop in our backyard and shovel snow when needed. Pretty mundane. Oh, and Tuesdays and Thursdays I babysit my three and a half-year-old grandson. My only published pieces were back when I was in college and in local publications. Well, I guess I had news releases published when I worked for the United Way, but I don’t have any links to those either. The pictures I hopefully attached are Chief (tan dog), Inga (gray dog) and me and Inga having some girl time! Thanks, Jackie, for the lovely opportunity. I appreciate your friendship so much! A little too late…Friday fiction in five sentences. He was so mad he couldn’t wait to teach both of them a lesson or twenty. Furiously he swerved round the bend and simultaneously picked up his phone and took a second look at the incriminating picture. …The angry haze lifted from Tony’s eyes. Featured Posts # 71…Share your post links. Store your obsessions in the cube: an interesting combination of thoughts, senses and sensuality. Diabetes management is not a one size fits all and why: It must be a struggle to live with an ailment that needs constant monitoring and a complete overhaul of lifestyle. I find Anna’s posts on Diabetes not only informative but humourous as well. Blackwall blog: a refreshing blog that belongs to a new blogger connection of mine. Inspiring, candid posts on life, PTSD, anxiety, panic, family, photos and much more.